Round up your clan for an unforgettable family holiday at Baan Kilee. With eight bedrooms, multiple indoor spaces, a large pool, swim-up bar and playground, the home is well-equipped to accommodate travellers of all ages. An on-site team that delivers five-star service is cherry on the cake. Eight bedrooms are spread out across the compound to accommodate 12 adults and 6 children. Just like the common spaces, each of the rooms feature generously proportioned interiors that are furnished for your comfort. Four of the rooms feature king beds, the fifth room is equipped with twin singles and the sixth bedroom (converted from a kids playroom) comes furnished with three single beds. Extra beds may be set up in two loft bedrooms (accessed by a ladder) to house additional guests. Relaxing outdoors with your clan is a breeze at Baan Kilee. Kitted out with family-friendly amenities, guests may choose from two kids pool, a swimming pool, dining sala and beachside lounge. Sofas and sun recliners plonked down just steps away from the beach let you soak up the sea views from the comfort of your villa. Take things up a notch by arranging for a beachside massage or rolling out sunbeds on the coast. With its open-air living pavilions and seamless layout, it’s hard to tell where the outdoor spaces end and where the indoor areas begin at Baan Kilee. Each of the living areas feels airy and wonderfully expansive, thanks to the indoor-outdoor design. A media lounge, equipped with sofas and a projector screen lets guests enjoy movie marathon nights in comfort. 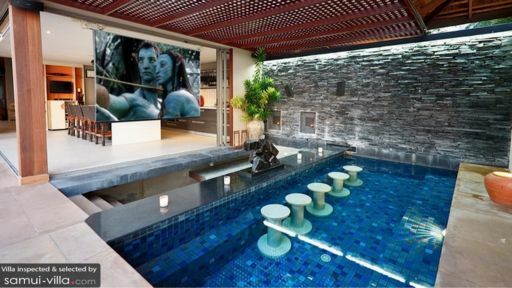 Baan Kilee is also well-equipped for hosting a poolside movie night, with amenities like a swim-up bar and poolside projector screen. The sprawling villa offers other options for keeping dry: stretch it out at the yoga pavilion, play a game of table tennis, enjoy cocktails by the breakfast bar or tuck into a feast at the capacious dining area. With an incredible on-site team, guests will not be lacking in any of their travel needs at Baan Kilee. Daily breakfasts and airport transfers, along with villa manager and private chef services are included with your stay. Baby cots (subject to availability) may be requested at no extra cost. Services offered at additional cost include: villa pre-stocking, chef service for meals provided for late or early check in /out, car rental, additional bedding, in-villa wine selection, in-villa massage and babysitting service. An fee applies for hosting parties and events in the villa. While Lipa Noi doesn’t offer much in terms of entertainment, its sense of remoteness and tranquility will appeal to villa vacationers seeking to get away from it all. For ultimate relaxation, try one of Baan Thai Spa’s (at InterContinental Samui Baan Taling Ngam Resort) decadent rituals or a group yoga class at the serene Marga Yoga retreat. Families will enjoy zipping around the island to explore attractions like the Samui Cultural Center, Laem Sor Pagoda, Secret Buddha Garden and Na Muang Waterfall. Pop over to Nikki Beach Club for sundowners and a fabulous Sunday brunch. Air Bar, a plush rooftop cocktail lounge is nine minutes’ is known for its stunning sunset shows. For beachfront dining, we recommend The Five Islands Restaurant, The Island View Restaurant and The Virgin Coast Restaurant. If you don’t mind driving out further, hop into a car for a 20-minute ride out to Thongkrut Fisherman’s Village. Here you’ll find an array of seafront restaurants dishing out some of the freshest seafood catches on the island! Baan Kilee is an absolutely AMAZING villa and probably BEST service I've ever experienced - I would highly recommend Baan Kilee. During the same trip to Koh Samui, we also stayed at another 5 star international chain resort for a few days and Baan Kilee was just so much better in every way. While the Villa itself is stunning, the thing that absolutely blew all of us away was the service. The team onsite is absolutely AMAZING! Both Rose and Pooh did an amazing job to cater for us. We didn't even have to ask for anything, they just knew what we wanted! An example is we bought a few cases of beers from the supermarket ourselves, the team not only unloaded them from the van, but unpacked them, and stocked them into a large esky with ice to keep them cool next to the pool for us - all without even saying a word! The in-house chef was excellent, catering to all our needs - the food was authentic, top-notch, better than Hotel restaurants and also works out cheaper than paying for room service from a hotel. There were always leftovers on hand so we were never hungry! The team setup a BEAUTIFUL dinner on the lawn next to the beach, with a BBQ and lanterns, all without having to ask, I can't speak more highly of the team at Baan Kilee. The beach is private, quiet and clean with a gorgeous sunset to die for. It's safe for swimming (we went out to the buoy and then out to the pier several times) and also great for running. Although the location is a little bit away from Chaweng (probably a good thing), we found we never really needed to leave the Villa. The Villa also has an excellent in-house driver (Thanks Wut!) and 14 seat van that took us into town or shops when we felt we needed it. The Villa also has in-house massages that were fantastic. The rooms and bathrooms were all spacious (much larger than hotel rooms) and there were ample beds and areas for everyone to have their own space. The WiFi reception was excellent throughout the resort and even out on the lawn and beach. I've been to many hotels, resorts and villa's in around the world, but Baan Kilee is honestly one of the best experiences I've ever had and I can't speak more highly of the team there. Thank you so much for taking care of us! I hope were weren't too much of a nuisance! Thanks Rose, Pooh and the rest of the team! We'll definitely come back one day soon! Just joined a fitness retreat held from Baan Kilee, it was simply AMAZING! I feel more energetic and positive, a truly fabulous break in fabulous surrounds. The staff at Baan Kilee were out of this world, as was the food. I will definitely be booking to go back with my family in 2015. We went to Baan Kilee with a group of 11 friends to celebrate a joint milestone birthday for 4 friends. The villa was just perfect, it was huge with lots of different areas to chill. We ate most of our meals at the villa and only had to pay for the ingredients for each meal. All the meals were extremely tasty, we had Thai food mostly and also one BBQ night. The villa had helped us organise a group yoga class which was so good that we requested another yoga class the next day! One of our friends had left her mobile phone in a car during a transfer and the villa staff went out of their way to help us communicate and pick up the phone. The villa itself is absolutely beautiful. Despite the fact that we went during rainy season, we all had a fantastic time. 5* service! Was there for a beach wedding. We felt like celebrities! The place is beautiful! Rooms spacious and spa like. Bathrooms were huge with outdoor showers in each villa. Staff was great and got us everything we needed. The location is right on the beach. Pictures do not do this place justice! Oh and the food prepared for us was so wonderful! Just go! You will not be sorry!!!!!!!! We had our wedding at Baan Kilee in October 2014. 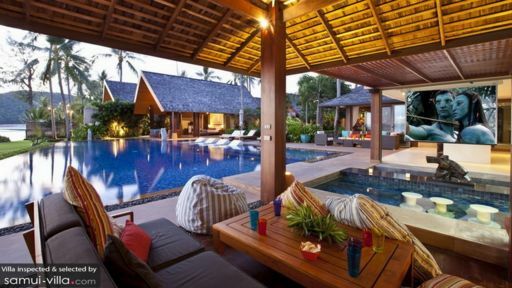 We had been to Baan Kilee once before for a Fitness Retreat and knew it was amazing. But the wedding was even better than we could have ever imagined. All the wedding planning stress disappeared the moment we arrived. The villa is absolutely gorgeous. The rooms are spacious and luxurious, and there is a beautiful beach and swimming pool right at your finger tips. The staff was polite and attentive without being overbearing, and the food was unbelievable! Unfortunately, a storm came when we were due to be on the beach getting married. I watched from the master bedroom upstairs as the villa staff acted quickly to keep the guests comfortable and calm while they reorganized the days events around the weather. In the end we had a beautiful wedding on the beach, and they reorganized one of the indoor spaces to create a stunning dining room. We had people from all over the world attend our wedding and literally everyone said they were coming back. I could not have asked for a better place to have my wedding! We were lucky enough to host our wedding (week) at Baan Kilee in September 2014 & it exceeded our expectations at every turn and in every way. I cant recommend Baan Kilee highly enough – this team are absolute experts, they know how to produce a top class wedding/event and worked with us to keep our dream wedding, within budget. The villa, pristine; The views, stunning; Rose, Poos, Oi and their Kilee/Puri/Chorn team, exceptional; The food, diverse & tantalizing; The parties, explosive; The sangsom, dangerous; The fire dancer, world class; Sanya, the yogi, exceptional; We took over Kilee, Puri and A Chorn (the neighbouring villa’s) and welcomed our nearest and dearest to Koh Samui with three events all produced expertly by the team. 1) An opening dinner (35 people) on the Wednesday night (buffet style thai food – the best I’ve ever eaten) and a fire dancer who, having seen a lot of these guys and not impressed by many, I thoroughly recommend. (Meet and greet for all guests (82) at Nikki Beach on the Friday night). 2) The wedding day at Kilee on Saturday (82 guests): The wedding, is giving me tingles, still; Baan Kilee, stunning The sunset, tear jerking Tina (signature) and team, perfect; The food, perfect; Steve the DJ, dance floor creating; Johnny the celebrant, gorgeously warm; Dany the stylist, genius; The flowers & decorations, mesmerising; Diving into the pool in a silk wedding dress, ha! Still mixed feelings.. 3) Finally, the pool/after party spread across Kilee and A Chorn on the Sunday (70 guests), masseuse, volleyball and hog roast – perfection! Every request was met with a smile, delivered with expertise and in many cases bettered, within budget and without seeking thanks. The estate was kept pristine throughout the week without us ever seeing or feeling the work going on behind the scenes. A magical experience, I can't thank the-Tina's, Rose, Poos, Oi and the team enough for making our wedding day, and the week around it, perfectly magical! 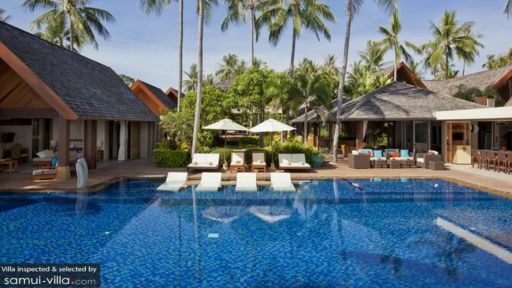 Baan Kilee could not be a more perfect place to stay for a true Koh Samui experience. The villa features an incredibly attentive and friendly staff, stunning detached bedrooms and living areas, an infinity pool leading straight onto the beach and a view that can only be described as resembling paradise! Despite staying with three families of wildly varying ages, there was really something for everyone and there was not a dull moment. Could not recommend it more. 15 of us - three generations of the family aged 3 to 70 years - had a wonderful stay. Nothing was too much trouble for the excellent staff. Everything was perfect - the place itself, the staff, the meals, the facilities: everything! We just spent a wonderful week at Baan Kilee. We had 3 generations celebrating a 70th birthday. The villa catered for all ages with a playground and paddling pool for the youngest through to kayaks and a paddle board for those a little older. The huge infinity pool running along the front of the property is superbly designed with loungers in and seating all around the pool together with a shallow area for children. The beach is beautiful white sand and clear blue water. There are numerous loungers around the pool on the lawn and a hammock to round it all off. The villa has two large indoor dining rooms the larger which could seat 20 or more. All the rooms were large and well appointed the master bedroom being enormous with two additional beds which was perfect for the family with 2 boys under 3. At least 2 of the rooms had outdoor showers and extraordinary marble baths off the bedrooms. There is an enormous media room with a projection screen and countless DVDs with seats for 12 or more people. However the over arching element of what made our holiday was the service of Rose the villa manager and her staff. We had two birthdays where dinner was set up on the lawn just above the beach. For one Rose was able to find a fire dancer for a show on the beach that was quite mesmerising. She organised vans to the various sites around the Island and a trip to the five islands that the villa overlooks in one of the traditional Thai fishing boats. Her staff spoilt our 2 youngest both under 3 years and would often entertain them for extended periods of time. We ate all our meals at the villa where the staff sourced the food and cooked to our requests. We had a great range of meals and enjoyed their many recommendations taking full advantage of the great local seafood. The 6 bedrooms with 3 having the potential to accommodate an additional 2 children gives the property great scope to cater for families. We only used 5 of the bedrooms. We would have no hesitation in recommending this property. Thanksgiving Nov 2013 at Baan Kilee on Koh Samui with friends was sensational. The villa itself is spectacular and nicely secluded with the facilities and staff tremendous on all accounts. The rooms are beautifully decorated and are all individual in both entrances as well as decore. The team of staff headed by Rose are wonderful and literally meet with your every request with a smile and whatever it is - is done immediately. The food (you supply yourself) is prepared by the Chef for all meals. Breakfast was leisurely and catered for the early rises, beach walkers as well as the sleep in laters who partied well into the early hours. The eveing meals were a standout - The Turkey feast on Thursday 28th was a Thanksgiving never to be forgotten - there a variety of dining locations encompassing two very large dining areas as well as a beautiful meal on the lawns beach side under the stars lite by flaming torches finishing with the release of Thai flaming lanterns into the sky. Nov is known as the wettest month and we had our fair share of sporadic down pours but remarkably it did not dent the 5 day stay at all. The rotation of inhouse provided Thai-styled massages were a big winner and lazing in and out of the pool or in the ocean was just heaven. This villa is absolutely ideal for small grouped weddings or in our case groups of friends or a combination family stay. We had 15 (5 couples with 5 children in total) staying and between the pool, ocean, poolbar, kitchen bar, TV/entertainment room and your choice of numerous sun lounges - either half submerged in the pool or scattered around the pool, grassed area or beach - You just couldn't go wrong. It is a litle hard to find - but once located you tend not to leave the villa. I can highly recommend Baan Kille for a tremendous group stay - we stayed at Chaweng Beach for a couple days prior arrival so got our fix of the bar/restaurant/shopping scene there which was very good and sooooo much better than Phuket.. The best part was we got that all sorted first and then relaxed and enjoyed everything that Baan Kilee had to offer to wind down. As always people make it - the friends on this stay, both old & new were great and the staff under Rose's supervision at Baan kilee just took our experience to a much appreciated higher level. Baan Kilee is recommended for couples and/ or group functions. I was there with my partner in Nov 2013 as part of a bigger group party and found the place lacking in nothing at all. It is peaceful, beautiful, staff are lovely and you get to have a massage in your own room. The rooms are very nice - we stayed in a villa for 2. Highly recommended for couples. Would go again. Setting - absolute beachfront, secluded private beach, glacially calm most days, waking up to a view to die for! Well laid out, with a beachfront lazing lawn, then a 22m infinity pool, then a garden, all surrounded by accommodation, outdoor lounge, indoor lounge, 2 dining rooms and a breakfast room. Yes, it is at the opposite end of the island from the airport - but this also means at the opposite end of all the hubbub. Accommodation - as all the other reviewers, the place is enormous, and beautifully appointed - the furniture is so rich! We had up to 21 people staying, some singles, some couples, and all were accommodated luxuriously. Design is fantastic, with steep high roofs and ceilings, floor to ceiling glass, separate access to each room, huge beds, extensive cupboard and drawer space, big, marble bathrooms, outdoor and indoor bath and shower, luxury soaps - the list goes on, you won't be disappointed. Facilities - built for entertaining, it would be the perfect place to hold a party for a family of 6 in the outdoor lounge, all the way up to a wedding for more than a hundred on the front lawn. Comprehensive music system, multiple projector tvs, satellite tv in all rooms, complimentary wifi, all rooms air-conditioned, luxury transfer service available. Service - this was perfect. The Thai hospitality standard was definitely exceeded - from the standard food fare, which would rival most of the restaurants on the island, to the gentle interactions, catering for every need, I was unable to fault them - every detail was done to a very high standard. Having stayed in 100s of hotels, resorts, villas, apartments, etc, I don't say that flippantly. Each day's room cleaning was super quick, and returned the room to the state we found it in on day 1. Each night, the sweet smell of vanilla and lemongrass filled the room, with the romantic lighting setting! Rose, the head house-keeper was always on hand to arrange any outing, meal requirements, wifi issues, iPod connectivity issues, slideshow setup issues, etc, etc! Every polite request was almost instantly arranged. Loved the fire show, especially the human roman candle! Sent a lit lantern into the sky! Unfortunately I can't comment on the paddle board, kayak, fitness retreat, yoga sessions, boxing, etc - I just never got around to them! I did get flyboarding in somehow though - organised by Rose, what a blast! Last week my wife and I met a group of old friends at Baan Kilee for a week away without the kids. Before that we stayed at the Banyan Tree in one of their Sanctuary Suites and unusually for me I took the time to write a review suggesting that it was probably the best hotel I have ever stayed in. Whilst Baan Kilee offers a much more personalised experience in terms of privacy and personal service, I can honestly say it completely surpassed our Banyan experience, so I am compelled to write a second review in as many weeks. The setting is picture postcard perfect. The rooms, furniture and fittings are of the highest standard without loosing the cool relaxed ambience we had hoped for in a private Villa. The infinity pool is a great size for a large group and is only a stones throw from the Bar. Just meters away from the pool is the beach which had really nice fine white sand unlike some of the other beaches we visited and also benefits from a really shallow slope into the sea making it very safe for swimming. The food (especially the local Thai food) was the best we had on the island, and the resident chef had a huge variety of dishes to keep us interest for the whole week. Finally the service and organisation of extra services like in house massage, yoga clases and boat trips was fantastic and there wasnt anything that they couldnt do for you. Thanks to everyone at Baan Kilee - Possibly the nicest place we have ever stayed! Our large group of adults and children had a simply wonderful time in this astonishingly beautiful and well-appointed villa, and took advantage of many of the facilities. We weren't there for the boot camp - we were there to relax- but there was training on offer, as well as massage and other treats. The food was always excellently prepared and presented by the onsite team, and the staff helpful and efficient. Everyone had a great time - I'd thoroughly recommend it. I was there for a friend's birthday party in October. It was my first time to Koh Samui and while I had my honeymoon at Krabi over a decade ago, and have been to various resorts in Thailand for company's team building since 1997, Baan Kilee tops the list in terms of design, location and management for a luxury beach resort. For people who are used to busy marathon schedules of packed meetings/conference call, it will be a refreshing immersion to recharge at the Baan Kilee, especially with good friends. Just let time flow on by itself. Swim and dine whenever you like with a ready to serve staff. I arrived half day late and missed a boat cruise. Did my first yoga class. While there are activities that one can do outside of the resort, I ended up spending most of the time at the resort as it was a beautiful place ... when one is finally not in so much of a rush there may be moments of appreciation ... and wonder if nature is whispering ... I intend to go back for a team building event. We had a group of 15 comprising of adults and children (families and singles), and all of us were over-awed by this wonderful holiday! The setting is even more wonderful than it appears in the photos, and sitting overlooking the infinity pool and the beach watching the sun set of an evening was an experience we will never forget...the ultimate in relaxation! All the bedrooms/bathrooms were amazing, and the dining areas were the ultimate in indoor/outdoor dining, with day-beds located directly behind the main dining table for a little lie down after dinner. Rose and the staff were amazing. We were treated like royalty on arrival, and the staff were very attentive to any of our needs. They were very easy to speak to about arranging day trips and activities, and would always discuss with us the best way to do things ensuring we had a great experience with good value for money. And the food was fantastic...aroi! We gave the chef a rough idea of what we wanted to eat that we chose from the menu, and the chef would add or remove dishes to ensure a well-rounded meal. I would be surprised if I could eat such wonderful food for 8 days straight anywhere else! All in all an amazing holiday, that we are definitely planning to do again! Thanks Rose and Co., we hope to see you soon! We spent nearly a week at Baan Kilee in October and were blown away by the experience. Hands down, it beat every experience we have had at the top resorts in Asia due to the way it catered for families with children. We were a group of 2 families with 6 children ages 2-10. From the moment we entered the gates and closed them behind us (to keep the kids in) we never felt the need to leave. We kayaked, paddle boarded, swam and snorkeled in the calm and shallow waters off the lovely beach in front of the villa. We even sat and watched as the older kids did the same, allowing them some independence and adventure and yet feeling that they were completely safe in the lovely waters. We spent countless additional hours in the beautiful infinity pool overlooking the beach and the very well laid out living areas around the pool. The kids loved the in-pool bar and ate many meals there, not even having to leave the pool. They also watched a movie from there - a real treat for them. The bedrooms are luxurious and really well laid out for families and groups with lots of special spaces where extra beds are tucked away to accommodate young children and additional guests. The kids favorites were the lofts above 2 of the bedrooms which are very comfortable and spacious. We didn't need to use them for sleeping as 4 of the villa's 6 bedrooms easily accommodated our group of 10, but the kids thought they were the coolest thing ever. The food was amazing and the villa Asst. Manager and Chef were wonderful at suggesting new dishes to try to expand our Thai food horizons, while equally offering some of the most delicious takes on our favorite curries, fresh spring rolls, and salads. Daily massages, wonderful staff, fireworks/wish lanterns and lots of water and pool toys made this the best family holiday ever. I can't wait to return. What an incredible villa experience! We had our wedding here with Tina at Signature Weddings and can't recommend it enough. it has everything - great views, stunning rooms, complete privacy, private beach plus some of the best staff you could ask for, headed up by the fantastic Rose & Chard. We knew it was going to be good from the photos and videos online, however it's even better when you're there in person. The villa is kept incredibly well by the staff and all the rooms are stunning with the pick of the lot being the master bedroom overlooking the entire villa space. You also have the option of the in house chef cooking for you and I can't recommend this enough. You'll be seated in the large & stunning dining room while a number of courses are served to you over the evening. A lot of people have written about the infinity swimming pool and it's easy to see why! Sitting at the end of the villa (before a garden and beach) it is the ideal way to finish off a day. It even has it's own swim up bar at the end of it! A truly stunning experience and we will definitely be back!